Attorney John P. Sanderson, Jr.
At The Sanderson Law Firm, we are committed to helping people throughout the Wilkes-Barre and Scranton, Pennsylvania area with the complex issues involved in probate and estate administration. We understand that dealing with the estate of a family member can be emotionally difficult. Our attorneys have significant experience dealing with the administration of the will as well as estates with the register of wills and the orphans’ court. Our probate and estate administration attorneys represent clients in Wilkes-Barre, Scranton, Hazleton, Berwick, and Bloomsburg, as well as Luzerne County, Lackawanna County, Monroe County, and throughout the Poconos region. In addition, we attract clients from Columbia County, Wyoming County, Philadelphia, Harrisburg, and Pittsburgh. Estate administration refers to the process of probating the estate of a decedent, which generally includes collecting, inventorying and appraising assets; paying and collecting debts; filing and paying estate taxes; and distributing any remaining assets to beneficiaries. An attorney experienced in probate and estate administration can help simplify this complicated process. The estate is the total amount of property owned by the decedent at his or her death. Once a person dies, the estate is submitted to the probate court. If there is a will, the probate court will determine if the will is valid and then oversee the administration of the estate by the executor (the person appointed in the will by the decedent to oversee the estate). If there is no will or the will is determined to be invalid, the probate court will appoint an administrator and the decedent’s property will be distributed according to the state’s laws of inheritance. The Sanderson Law Firm provides in-depth planning to ensure that your family is cared for, your assets are distributed exactly as you wish, and your estate is managed by people who understand your ideas and will carry out your goals. We prepare hundreds of wills each year. We have designed many wealth-preserving estate plans and helped create charitable foundations of many types. We are often called on to manage the transfer of our clients’ wealth. But our most rewarding role may be in providing continuity and a steadying force between the generations of families we have served for decades. Whether you have definite concerns – such as a charitable goals or children requiring special accommodations – or a general desire to provide security to loved ones in the event of a catastrophe, we have the capabilities to develop an estate plan tailored to your goals. Techniques range from the simple will, living will and general durable power of attorney to more sophisticated instruments such as life insurance trusts, qualified personal residence trusts, charitable split-interest trusts, dynasty trusts, charitable foundations, offshore asset-protection trusts, shareholder agreements and family limited partnerships. 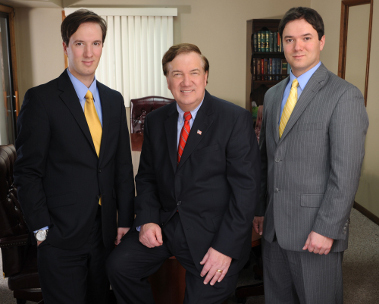 Our attorneys are here to service all aspects of your estate plan. Our services include maintaining ledgers and accounts, making distributions to beneficiaries, and preparing fiduciary and other tax returns. You may justifiably fear that your business and the income it produces will dissolve upon your death. However, there are many ways to minimize death taxes so that your family or others can continue to operate the business with minimal disruption. For example, a successful solution may include a plan that motivates and retains key employees who continue your business and sustain its value after your death. We have advised many entrepreneurs on their personal and business concerns regarding the succession of business ownership, intellectual property assets, environmental liabilities and other legal issues, in ways that benefit both the family and the business. Death taxes can devastate the assets that one has accumulated. No one plans to fail; people simply fail to plan. With proper planning, taxes may be deferred either until the death of the survivor of a married couple or until later date established by our client and attorney. Our lawyers can assist with other ways of minimizing taxes through estate and tax planning before death. We firmly believe that proper planning is the key to minimizing disagreements. When disputes arise, we are fortunate to be able to call on our lawyers who are skilled at litigation, mediation and other techniques for resolving even seemingly intractable difficulties. Should the need arise, our clients may rely on our practiced judgment and sound application in successfully litigating will contests and other disputes. In a practice that covers all aspects of real estate law, our law firm represent sellers, buyers, developers, lenders, architects, contractors, tenants and landlords. Our attorneys are experienced in handling and negotiating financings, leasings, acquisitions, exchanges and dispositions. Our attorneys counsel clients on a variety of issues, both legal and practical, including choice of entity, financing structures and negotiating strategies. We represent lenders, borrowers and investors during virtually every phase of the financing process, from debt and equity structuring, through due diligence and documentation to closing and implementation. Most people, and many businesses, enter into contracts without consulting a qualified contract attorney. At the law firm of The Sanderson Law Firm, our lawyers are committed to drafting, reviewing, and litigating contracts to assure our clients’ current and long-term interests are protected. Our attorneys routinely handle contract work related to business law, municipal law and real estate. Our Olyphant, Pennsylvania contract attorneys have handled a broad range of contracts for clients in different industries. In addition to drafting and reviewing contracts, we have significant experience handling disputes related to breach of contract, shareholder disputes, fraud, and misrepresentation. Our law firm reaches into every sphere of federal, state and local taxation, working with tax laws that are numerous, complex and frequently changing. The group’s lawyers regularly undertake tax planning for C corporations, S corporations, partnerships, business trusts, limited liability companies, individuals, estates and trusts, tax-exempt organizations, and regulated businesses such as mutual funds and banks. The corporate tax practice spans the life cycle of the firm’s business clients from formation – whether as a corporation, S corporation or increasingly as a limited liability company or other pass-through entity – to mergers and acquisitions, bankruptcy, reorganizations, sales and liquidations. In addition, we handle succession planning for the shifting of ownership of a business upon the retirement or death of a major shareholder or the acquisition of stock by key executives. In addition, the lawyers practicing in the ERISA area structure all types of employee benefits, including qualified defined benefit and defined contribution plans, ESOPs, 401(k), 403(b) tax sheltered annuity and cafeteria plans. The group’s lawyers also design incentive and nonqualified stock option plans, employee stock purchase plan, phantom stock plans, deferred compensation plans (with or without “rabbi” trusts), and various fringe benefit plans. If you or a loved one has been injured in an accident or by the negligence of someone else involving; automobile accident, truck accident, motorcycle accident, medical malpractice, aviation accident, unsafe or defective vehicle accident, dangerous or defective product, workplace injury (worker’s compensation), construction site accidents, dog bite, dangerous drugs, defective children’s product, nursing home abuse & neglect or falls due to unsafe conditions, let The Sanderson Law Firm review your case and determine what course of action should be taken. Referrals; Depending on the complexity of the case, our law firm may refer the case to a private practitioner or small firm that specializes in a particular area of personal injury law. If we feel this is needed, an attorney at our law firm will work closely with another private practitioner or small firm to successfully manage and bring to trial and/or settle your personal injury case. The Sanderson Law Firm has developed a partnership relationship with a number of private practitioners and small firms who specialize in complex personal injury areas of law. The Sanderson Law Firm has the experience and resources to represent you or a loved one who has been injured. We give Free consultations! By law, an employer is responsible for minimizing safety risks and making sure workers are not in danger. If you’ve been injured on the job, your employer has certain responsibilities to compensate you for your medical bills and missed work time. Most job-related injuries are covered by worker’s compensation, including injuries sustained in an accident (such as a fall or a mechanical malfunction) and those incurred from normal job duties (such as carpal tunnel syndrome or exposure to dangerous chemicals). To be eligible for benefits, the employee must have been injured within the course and scope of work related activity. While workers’ compensation laws can be complicated and ever changing, The Sanderson Law Firm know your rights and how to fight to get you the money you deserve. The Sanderson Law Firm has the experience and resources to represent you or a loved one who has been injured while in the scope of employment. We give Free consultations! Commercial debt collection issues can affect creditors just as much as it can affect debtors. The Sanderson Law Firm has gained a reputation in Lackawanna County, Luzerne County, Susquehanna County, Monroe County, and Carbon County advocating for creditors and making all efforts to ensure that they receive the money they are owed. The Sanderson Law Firm represents credit card companies, business owners, and entrepreneurs who have provided goods or services and have not been paid for them. While some customers may try to avoid paying a valid commercial debt, attorneys at The Sanderson Law Firm have experience in locating debtors and employing creative strategies to get the money that the firm’s clients are owed. Those strategies in securing unpaid obligations include initiating collection efforts and legal actions in the appropriate court. The debtor can expect a lawyer at The Sanderson Law Firm to enforce judgments, levy bank accounts and seize assets. If you are a business unable to collect a valid debt, The Sanderson Law Firm can help you with commercial debt collection. Our lawyers who concentrate in Elder Law, continuously address common issues faced by older individuals. Traditionally, these issues related to claims for social security and taxation of retirement benefits, lifetime management of property under a Power of Attorney or a Living Trust, appropriate tax-saving gift plans, and estate planning for death tax reductions and desired distribution of property under Wills. Longer living, sometimes with diminishing mental capacity, has expanded such important personal issues now to include representative health care decision making, housing choices and changes, senior citizen benefits or support programs, disability claims, and long-term care planning. Where an older person lacks capacity or fails to provide for their own safety and well-being, a guardianship procedure may be necessary for protection. Long-term care planning likely will interface with health insurance plans, or the Medicare and Medicaid systems, with their complexity in coverage and changing procedures, which sometimes require appeals upon denied claims. In addressing elder law matters, we represent individuals respectfully, creatively, and competently, customizing our advice for each situation, and standing with our client for the length of his or her personal journey. Family Law covers some of the most emotionally sensitive areas of our lives, and can often result in severe emotional strain on all involved. The Sanderson Law Firm will give you the best legal representation working vigorously to secure the best results for our clients. We will resolve issues of Equitable Distribution, Child Custody, Child Support, Alimony and Spousal Support. The daunting process of wading through oil and gas leases and lease addendums that reads like legal riddles is enough to leave anyone overwhelmed. However, with the proper information and trustworthy guidance from an experienced oil and gas lease lawyer working for you, every landowner can find the answers to make the right decision on oil and gas leasing for their individual situation.